What’s it like to have a Lab Owl™ perched in your lab? One of the best ways we can give you a taste of what it’s like to have a Lab Owl™ on your team is to share reports from some of our industry’s leaders, and to share some of the stories of customers who are already leveraging the benefits of Lab Owl™ for themselves. A common thread throughout these narratives is our curiosity about what our customers are trying to accomplish and our consultative approach to finding smart solutions that leverage their existing strengths with new thinking, and when appropriate, new technologies, to make their processes smoother, more productive, better informed, and more trouble-free. Collaborating with 20 lab scientists, LabOwl™ was deployed to a lab with 80 bench top bioreactors. Their needs varied and the requirements of each scientist were met with the features of LabOwl™. In order accomplish the first two objectives, it was clear the customer would benefit immensely from a flexible packaged bioreactor control system. Enter Lab Owl™. 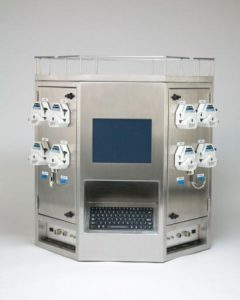 The Lab Owl™ station includes mass flow controllers for monitoring process gases (sparge, N2, O2, CO2 & air), probes for DO, pH and temperature, process pumps and servo control of the agitator. Connections are easily accessible from the angled front sides and the top serves as a drip pan where bottles and/or scales can be placed. The system includes software to allow the scientists to set-up their experiments and includes open tools for process analysis, trending and reporting including comparison of current to historical batches, trends showing multiple y-axes, pre-configured, and user-defined reports. There is also a unique event-based recipe management feature, which can enable devices, configure setpoints, program alarm and data collection parameters based on a flexible combination of events and elapsed time.